Recipe: Start with three couples and one happy dog. Stir in a teaspoon of nice river and a pinch of perfect weather. Pour into two canoes and two kayaks and bake them in the sun for a few hours. Result: Paddle Primavera! 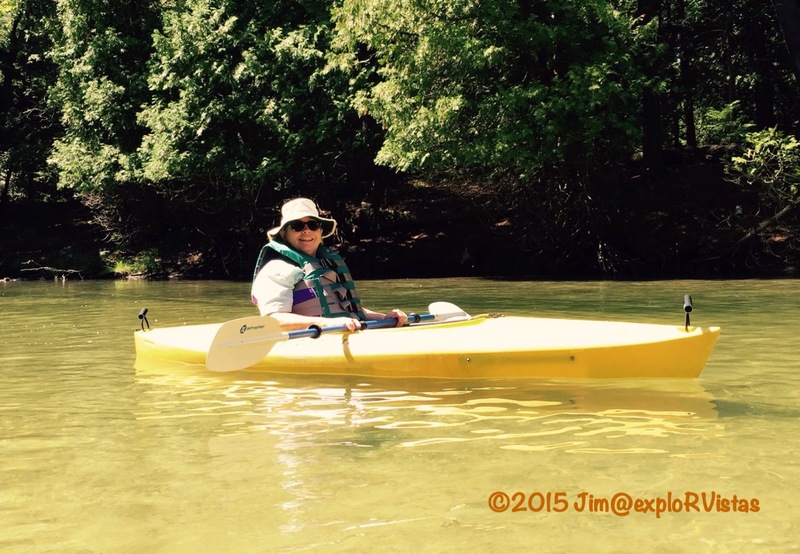 Over the weekend, Diana organized a paddle on the Lower Platte River in Honor, Michigan. Rod and Mary, who are fellow work campers, brought their dog Gracie with them. George and Grace, seasonal residents at Wild Cherry, joined in the fun. 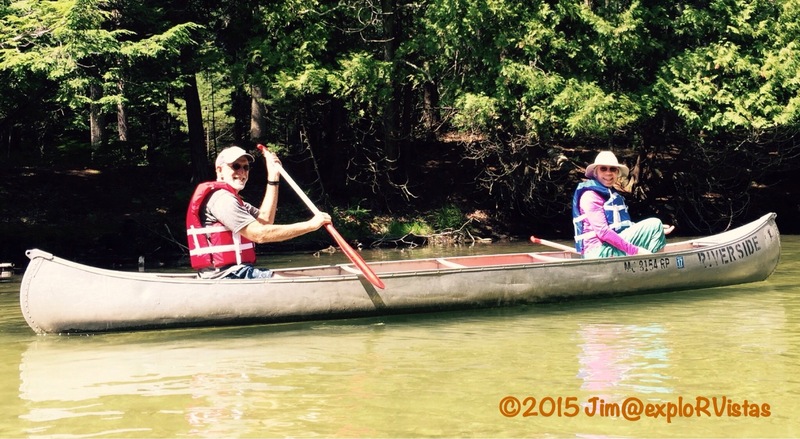 The journey began at Riverside Canoe Trips, as we were the only ones with our own boats. Diana and I put in at the National Park Service access across the road. And here are Rod and Mary with their dog Gracie. She was living the doggy-dream! About halfway through the trip, an influx of party tubes entered the river. We were a bit surprised at the quantity of them, as it was Sunday afternoon. Our theory was that most folks would have headed back home to the cities in southern Michigan by then. But aside from the traffic issues, everyone was having a great time! 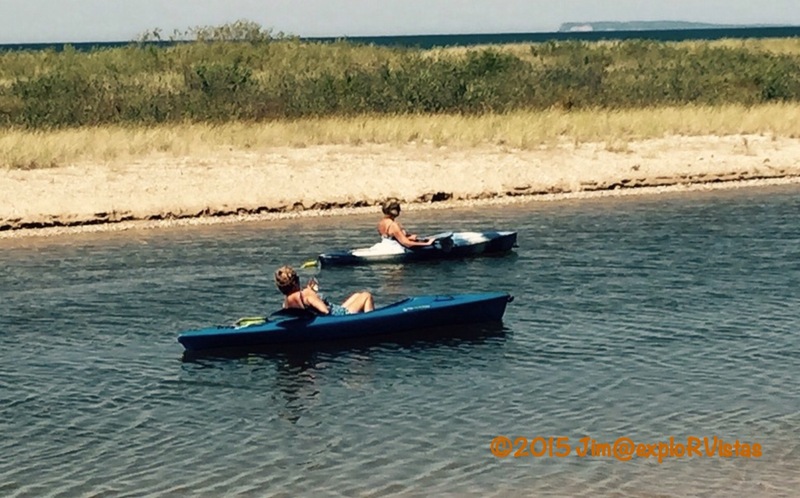 Once we got to the take out point, we loaded up our kayaks and our friends headed back to Wild Cherry Resort. Diana and I stayed behind and enjoyed the area awhile longer. 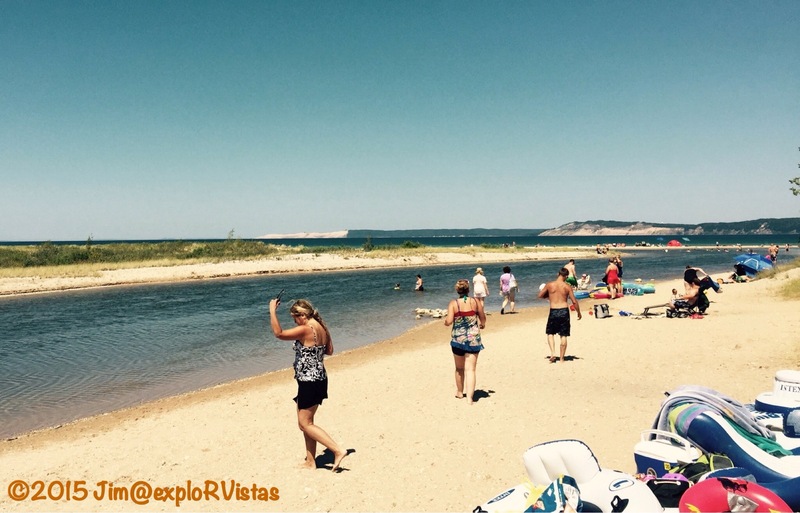 The point where the Platte River enters Lake Michigan is a favorite hangout for families. The relatively warmer river water is great for swimming. 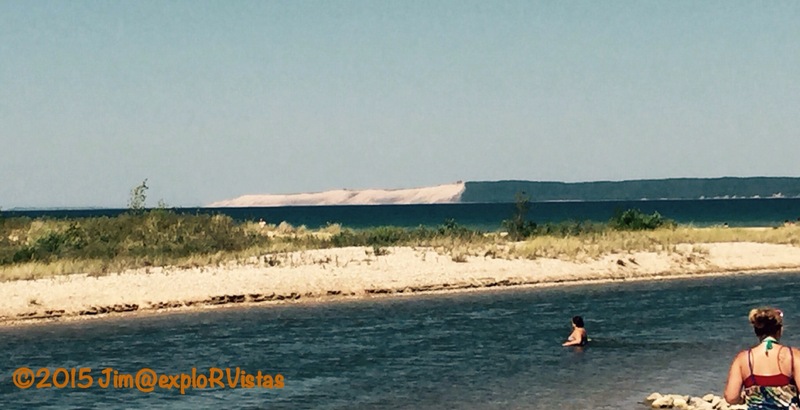 The bluffs at Sleeping Bear Dunes can be seen in the distance. I got a kick out of this paddler. Her paddle is tucked away and she is enjoying a glass of white wine. Click on the photo and zero in on it. Now there’s someone enjoying all the region has to offer! 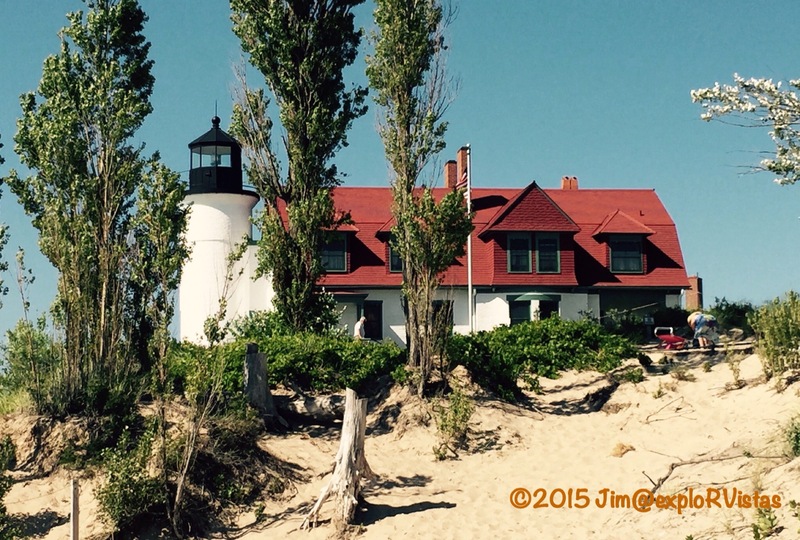 After we left the Platte River, we headed a little farther south to check out Point Betsie Lighthouse. We had been there several times in the past, and we have always taken in this iconic view from the south. 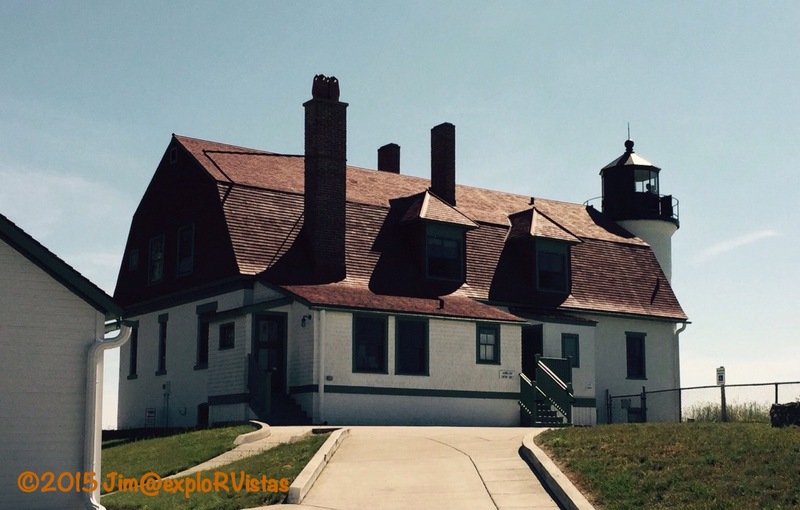 The Coast Guard transferred ownership to a local preservation group, and now the lighthouse is open for tours…allowing us to look at the north side. We unfortunately arrived after the last tour of the day, but we were able to walk the grounds. Our interest is piqued! 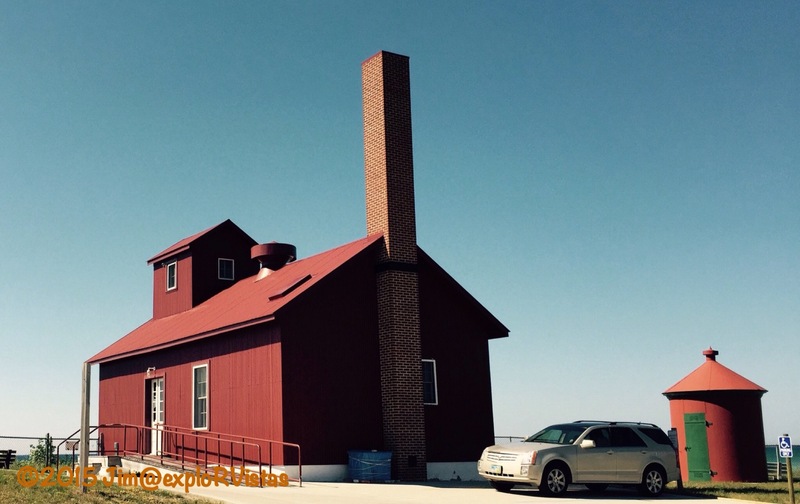 The fog signal building appears to be a replica, built on the old foundation. They also have an oil house to the right, which was used to store the flammable oil required to light the lamp in the tower, back in the day. We look forward to coming back here when we have more time. Once we left Point Betsie, it was getting a bit late. Instead of driving an hour back to Wild Cherry and making dinner, we decided instead to grab a bite to eat at Art’s Tavern in Glen Arbor. Art’s has been an area tradition for over 80 years. 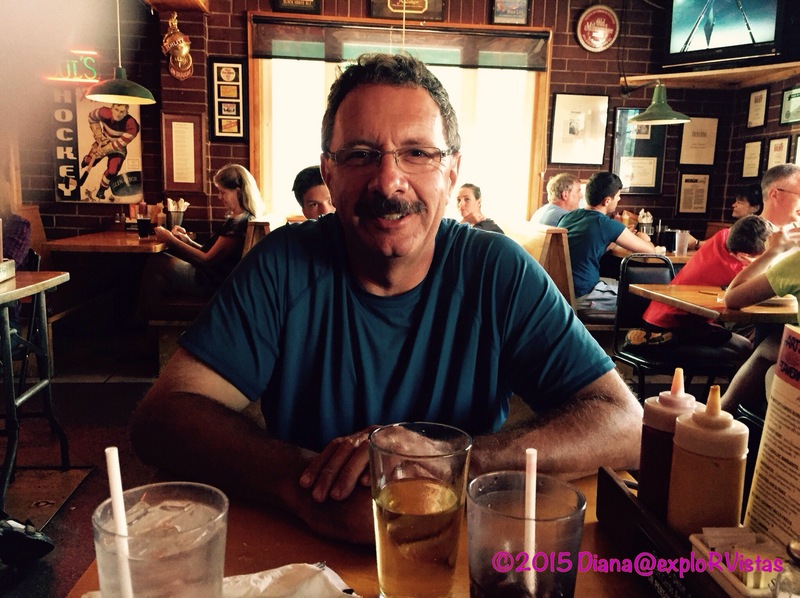 Here is one happy guy, knowing that there is a burger on the way with a gluten free bun! So, from Paddle Primavera to a gluten free burger, Sunday turned out to be a delicious day! We’ll have to go again, Camilla! That is a nice easy paddle. Looks like a fabulous day! Too bad the lighthouse was closed for tours. We’ve been fortunate to have an entire summer of those type of days, LuAnn! I’ll post more about the lighthouse when we get back there. Point Betsie looks like a great old light. I hope you get a chance to go back when in is available to the public. You make Michigan look SO inviting! Yesterday as we were headed into town for laundry, cruising along the shore of the Mississippi I was wondering about the ‘concept’ of getting a boat. there are times when the idea is so appealing and then we get ourselves off in the desert of wilderness and there’s little water to be found anywhere and it doesn’t seem nearly as appealing to carry something around mile after mile and never take it off the roof. Our neighbors in Palmdale brought a canoe along — and that’s what happened with them. They had it on top of the roof for the entire winter but he decided to go fishing in waders instead and admitted that the winter came and went and he never had the canoe off the roof. I fear that might be me. One of these years we have to try just spending the summer in MI…. maybe. our kid is having her 25th Anniversary in 2016, so there has been conversation about them meeting up with us in the Spring as part of their Anni trip. — which means we may find ourselves in San Diego in April, and probably do the things we had to be in too much of a hurry to do out there in previous years. We’ll have to see. We were talking about workamping just yesterday, and mulling around what we want to do. I’m almost sorry we committed so early to this winter’s gig. I really wanted to do a Refuge, and Bosque is a choice gig — but I’m not sure I want to be planned out that far in advance any more. 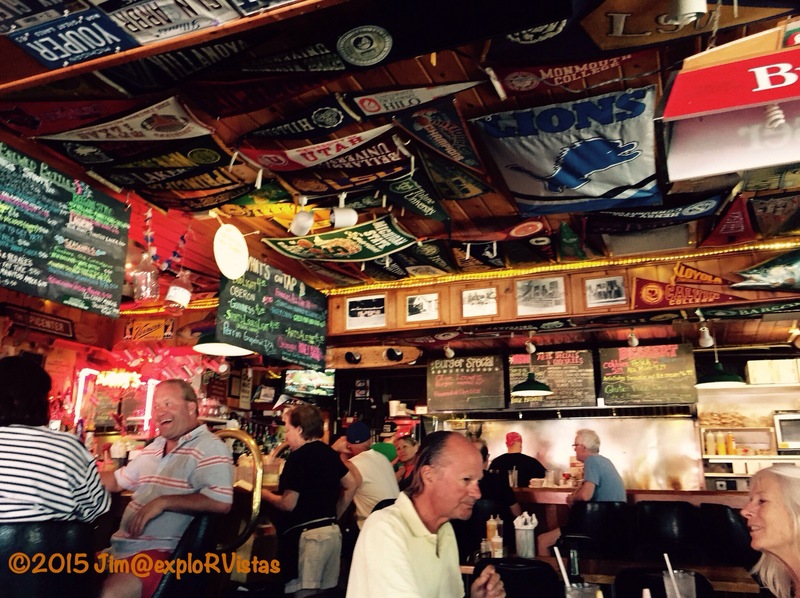 Summers in WI are tough without reservations but we are actively looking for other options. We’ll just have to wait and see what happens. If you are thinking of coming this way, email me…as I have may have some ideas for you. My email address is on the blog. Oh, and the boats on the roof: all it takes is one time in the water, after a long period of inactivity, to rekindle our love for our watercraft. We never regret having them. A yummy day!! Love your “pasta Primavera” kind of day…clever! The kayaking looks fun but Art’s Tavern looks even better. What I would not give to a bar burger or pizza right now! 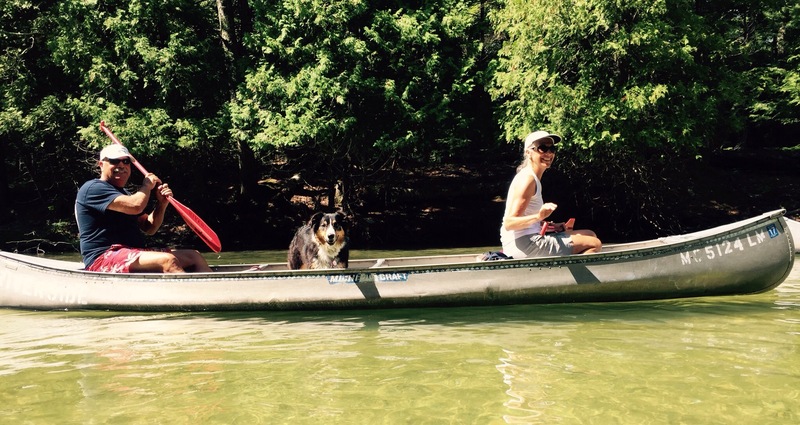 We loved paddling that river! Nice to see pictures of it again. Looks like you guys had a great time on the water. I’ll bet that burger was great! We want to try it either earlier or later in the day, and perhaps more towards fall, Debbie. We did have to navigate around quite a few tubes after the fish weir, so it would be nice to go when it is a little less crowded.